FOR IMMEDIATE RELEASE: Aug 26, 2013. 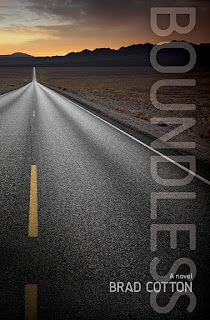 BOUNDLESS: A NEW NOVEL FROM AUTHOR BRAD COTTON. Best friends Duncan and Ray run a successful bookie business in Phoenix. Outgrowing the life they began in college, the late twenty-something pair set out on the road with a plan to never return. Their trip takes them cross-country with eventful stops in Las Vegas, Omaha, and Niagara Falls. Along their journey they meet several colorful characters and even agree to bring a pretty young girl named Ruby along with them for the ride. Landing in Boston to run an errand for an old friend, the travelers begin to lay roots in an attempt to forge for themselves the life they’d always hoped for. Easier said than done. As romances begin to burgeon, and one of their lives is put in danger, the group quickly discovers that where they are may indeed have little effect on who they are. Cotton describes the book as, “A modern journey with a touch of mystery, a touch of romance, a touch of humor, and plenty of interesting characters”. He hopes that fans of all genres will find something to love in BOUNDLESS. You can find out more about Brad Cotton at bradcotton.com, on Facebook, or on twitter, @bradcott0n. And, of course, you can pick up your copy of BOUNDLESS today on Amazon.